Zadar Croatia is one of the oldest cities on earth. Founded before 800 BC, by Ilirians, it has been occupied many times over the centuries. 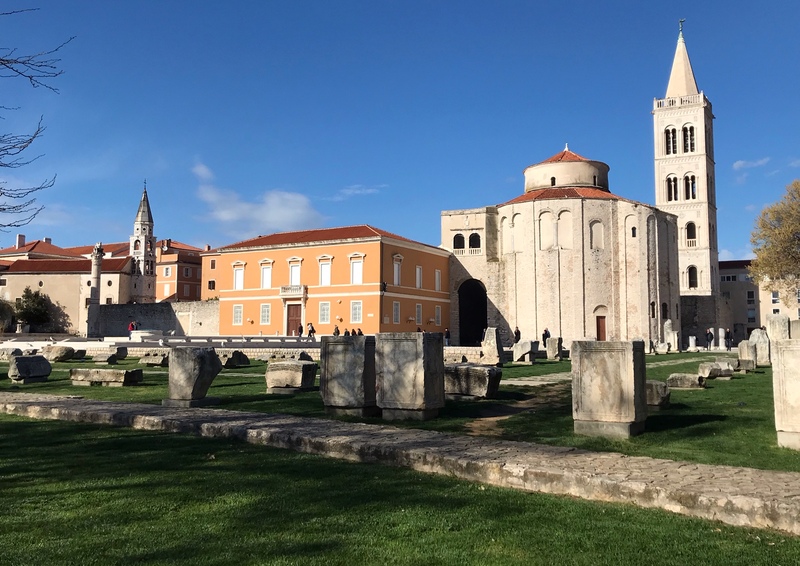 Zadar (pronounced Zuh-dahr) retains many artifacts of its invaders, mostly those of Romans and Venetians. 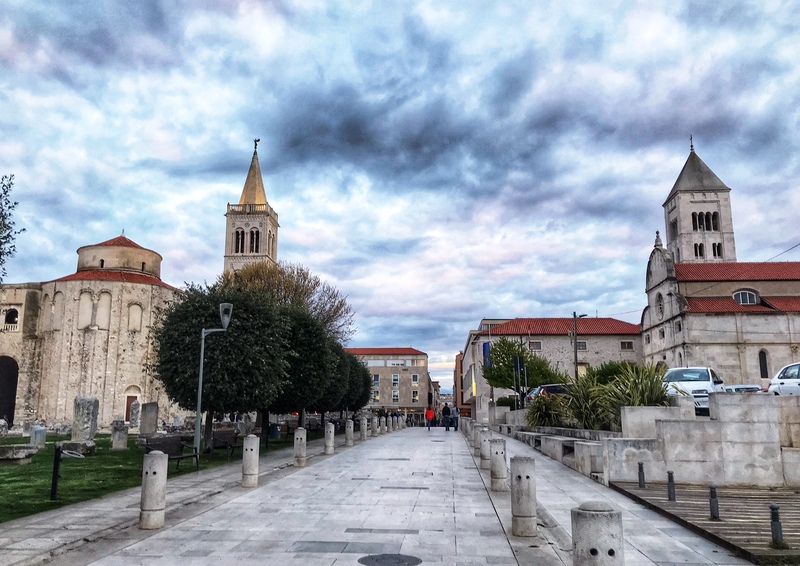 The old town is a small portion of the city but its the part of Zadar that attracts many visitors — not just history and old church fans like me but also young people attracted to its beach and party scene in summer. Old town Zadar feels like being on an island but its actually the tip of a peninsula, a boaters paradise. The main town is reached by a 100-foot-long bridge. Last evening sitting on a park bench overlooking the Adriatic Sea, watching the sunset unfold, I thought about how lucky I am to be here. Here’s a bit of what I’ve found here. I would never have found this 11th century church had I not taken an excellent tour with professional guide Sime Botica, arranged for me by AirBnB. The columns are “recycled” Roman remains. St. Anastasia cathedral is one of the purest Romanesque churches I’ve seen anywhere. Built in the years 1100 – 1200 AD, it is small and simple and beautiful. 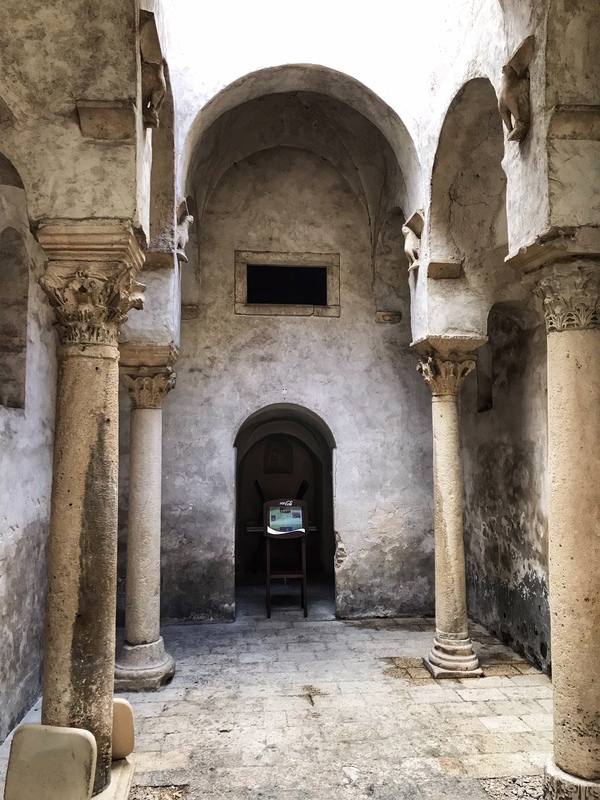 This view looks across the large collection of Roman stone artifacts toward the Church of Saint Donat. A resident of Zadar told me that this church was destroyed by Allied bombing in 1943 as was about 60% of the old town. The tower in the rear appears to be Venetian and may also have been reconstructed in the 20th century. A view of the cloisters at the Franciscan church and abbey. Rain threatened yesterday and the skies were too stormy last night to let much sunlight through, but the sunset here is often one of the best in Europe. Zadar is known for its musical Sea Organ created at the northern edge of the peninsula. Yesterday 158 members of the U.S. House of Representatives voted against reinstating the Violence Against Women Act, due to opposition by the NRA. 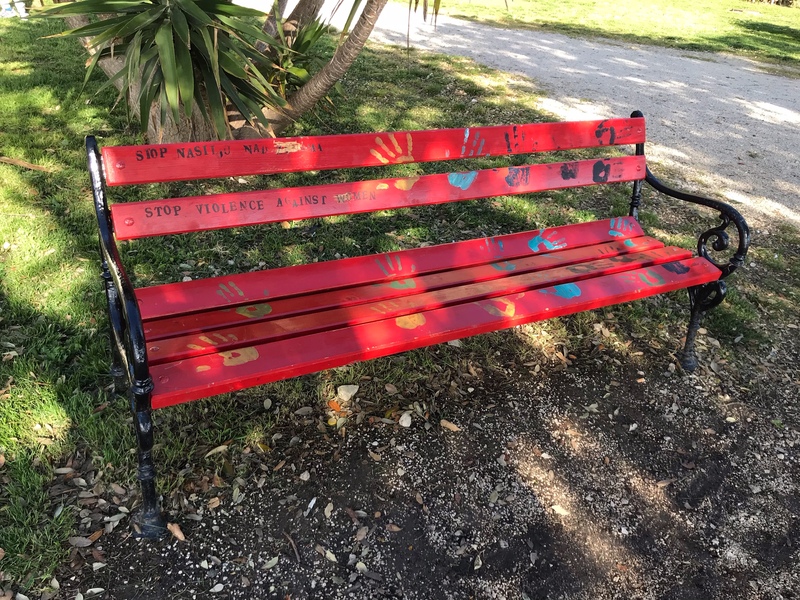 When I found this painted bench at the seaside, I had to share it with you. Look closely to read it. Croatia was a part of Yugoslavia until 1991. Following its declaration of independence it was embroiled in a war with Serbia; that war also involved Bosnia-Herzegovina. Because Croatians have long lived near the Adriatic, when the independent country of Croatia was formed it assumed most of Yugoslavia’s access to the Adriatic Sea. The war eventually came to an end in the late 1990s. Since the end of that war Croatia has become a very popular tourist destination. It’s often been said that “Croatia is like Italy used to be.” Most visitors are drawn to the coastal towns and island villages. Many cruise ships call at those ports. 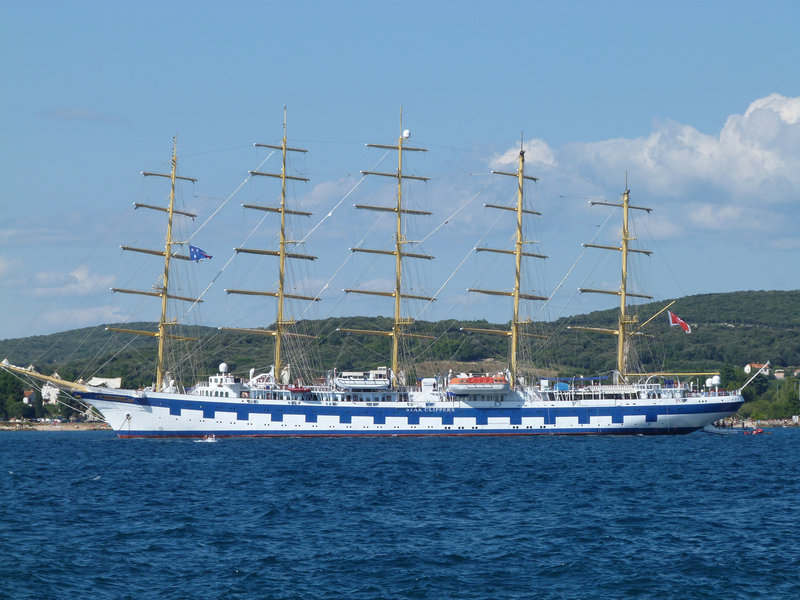 I have been to several of them including Dubrovnik and Split while escorting cruise groups. 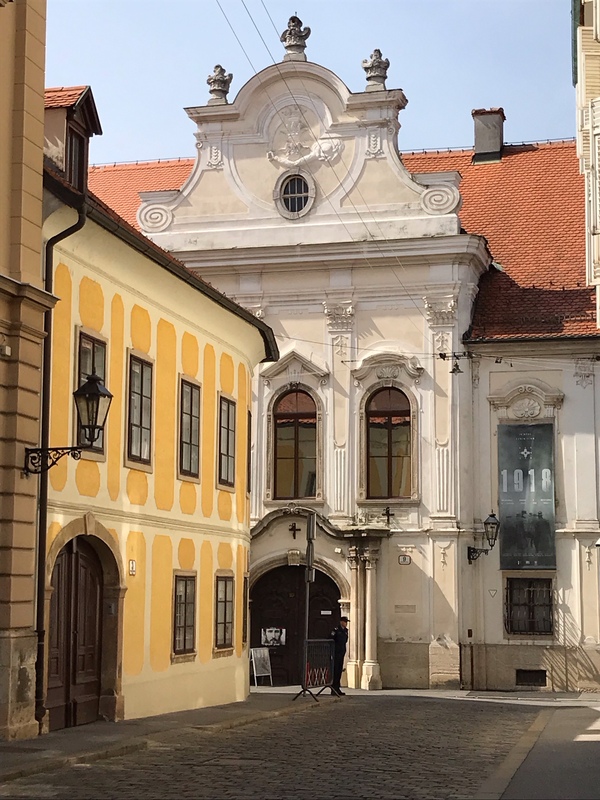 This time I wanted to explore Zagreb, the capital city. And unlike other famous places in Croatia, Zagreb is really a city. It was the fourth largest city of the Austro-Hungarian empire. People have lived here for millennia and the city will soon celebrate its 900th anniversary. 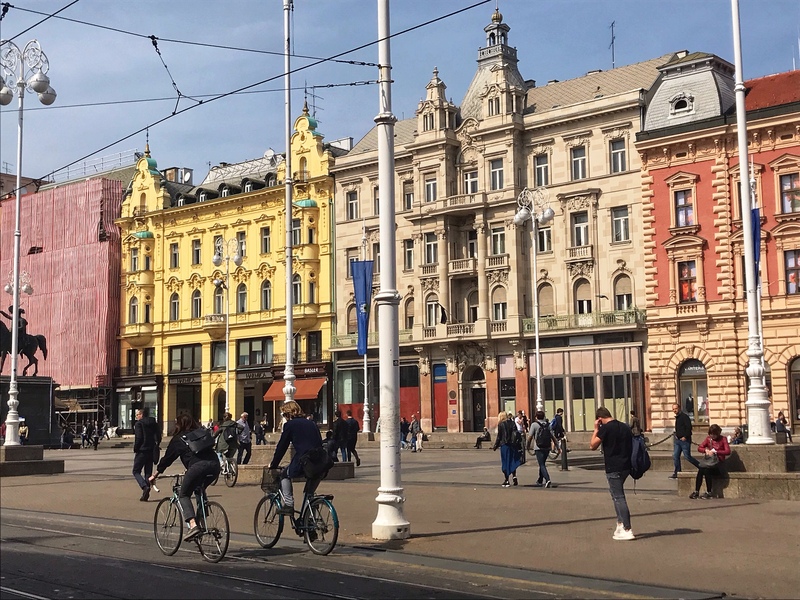 Despite years of communism and a devastating war, today Zagreb is apparently a booming and successful city. It’s appeal, I found, was based on city planning and building beginning in the early 1800s. Large public squares, parks and green spaces are a prominent part of this city. The most important of these is the Lenuci Horseshoe, a park consisting of seven connected blocks on two sides of a large square, connected by the botanical garden and the rail station to make an enormous letter U. Begun about 1820, the park is the location of magnificent buildings housing museums and more. (Please follow the blue link at “Lenuci Horseshoe” above to find Wikipedia’s excellent explanation of this masterpiece of urban planning.) Magnificent 19th century mansions line the streets on both sides of the “Horsehoe.” The city is filled with decorative mansions and office buildings constructed during the 1800s and early 1900s. 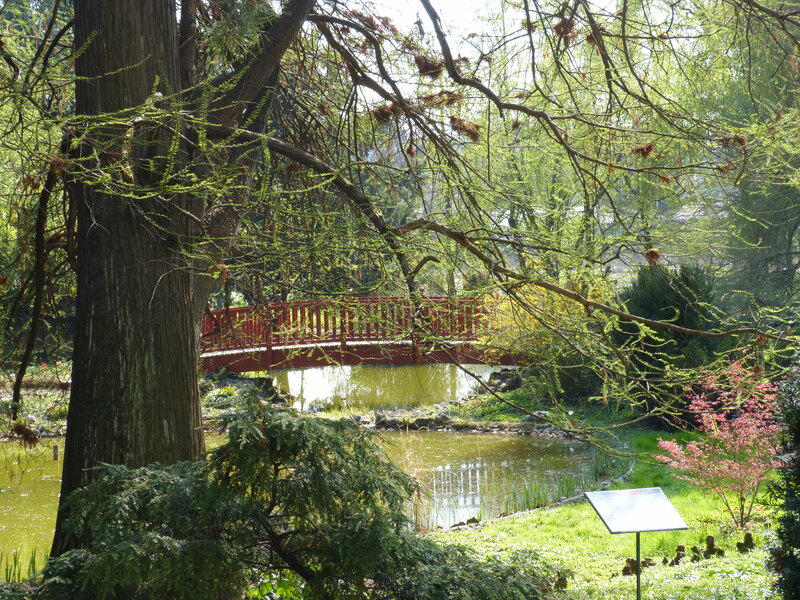 A scene from the botanical garden, part of the Lenuci Horseshoe. The gothic cathedral and its high towers on a hill overlooking the Lenuci Horseshoe were constructed many centuries earlier. On another nearby hill, the church known as St. Mark’s proudly flaunts its colorful tile roof. These churches stand on what were once hills occupied by the two enemy villages that grew to be Zagreb. 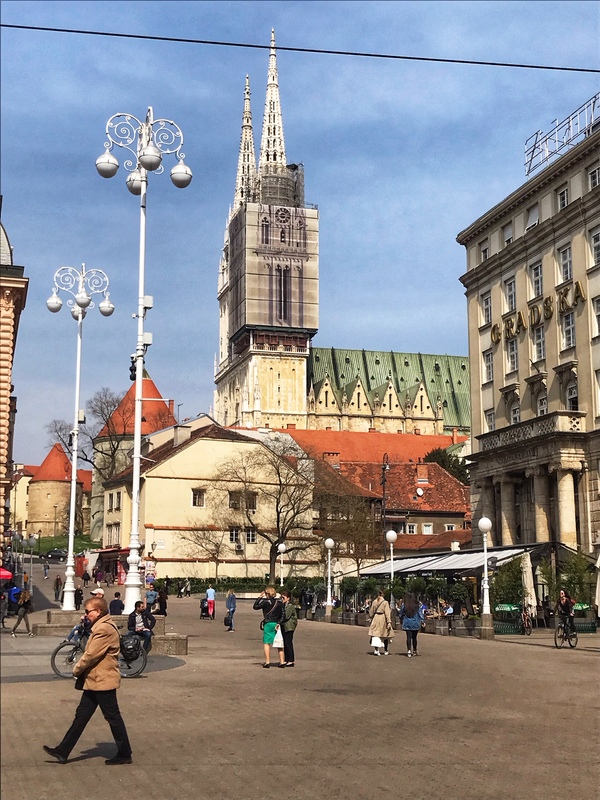 A years-long project to restore the steeples of the Zagreb cathedral is nearing completion. An original pinnacle is displayed outside the chuurch. It had mostly dissolved over the centuries. This photo shows towers from the ancient wall still standing guard over the cathedral. The colorful tile roof of St. Mark’s church is relatively recent. The small church dates from the 1300s. The tower is one of several that grace the skyline of Zagreb. Between the “Horseshoe” and the hills on which the city was first built there’s an enormous public square which was lively on Sunday. The main shopping street leads away from the square. 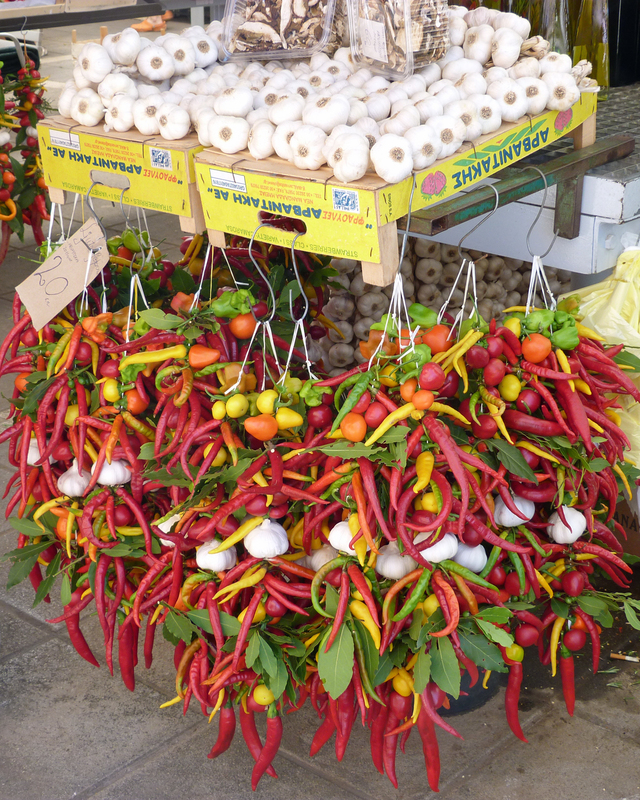 In the space between the hills a daily market offers appealing produce and small goods and crafts. This grand square with an un-pronounceable name, is the center of the city. I found Zagreb to be very affordable, with the cost of everything much lower than anywhere inside the E.U. The exchange rate was nearly seven “krona” to the U.S. dollar. Although the Croatian language is totally unlike Latin-based languages including English, I found that everyone I asked a question of spoke English and was willing to help me. The people here were very friendly. They seem to be proud of their city and their pride is certainly justified. 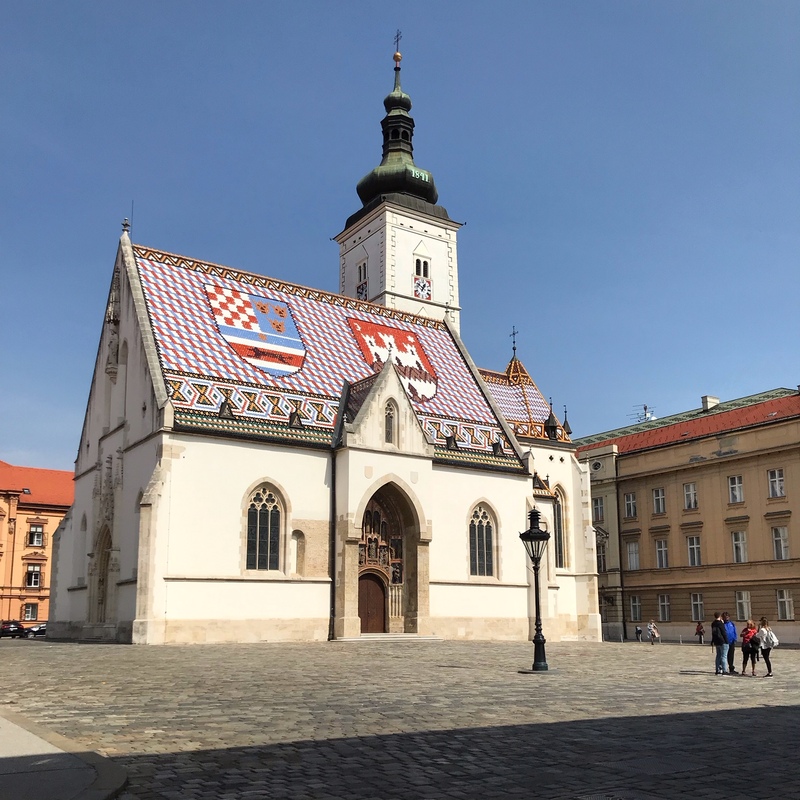 If you have a chance to visit Zagreb, I’m sure you’ll enjoy it. 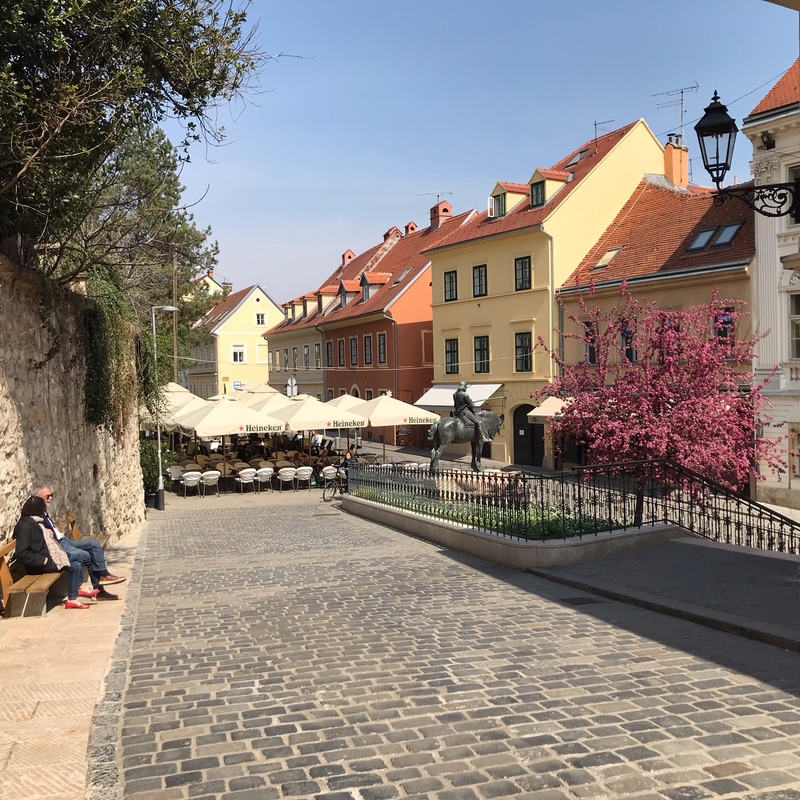 A very common scene in the center of Zagreb: cobbled street, well-maintained buildings from past centuries, a cafe under canopies where people meet for coffee. Another cafe scene. 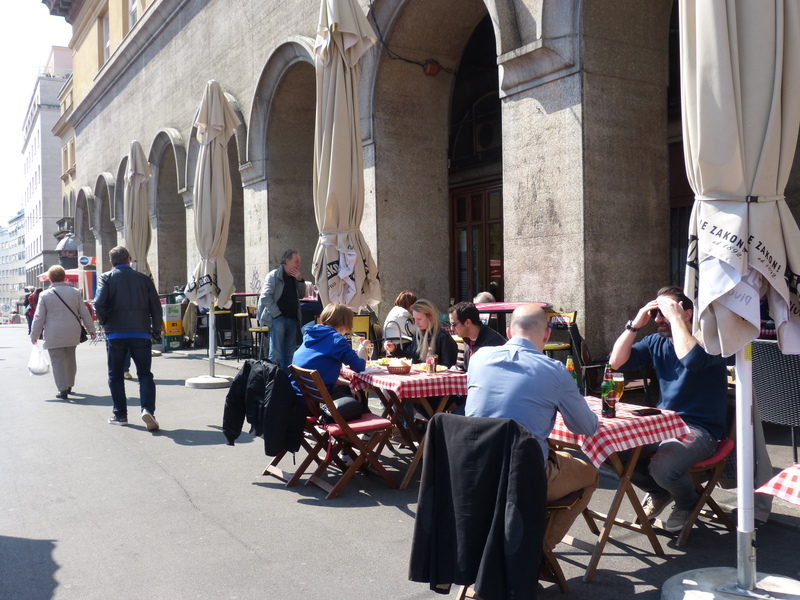 The weather was warm and sunny while I was in Zagreb and everyone seemed to be out enjoying it. I bought a can of cinnamon at Trader Joe’s a year or two ago. The brand name is Szedeg and there’s a small drawing of an ancient church on the can. That’s the only clue of where or what Szedeg is. Where in the world is Szedeg? Googling led me to a travel website on which I could lose an entire day. Although I don’t have time to write posts and edit photos now (11 days until this election is history!) I wanted to take time to share this with you. The site is Lonely Planet’s “Best in Travel for 2017.” http://www.lonelyplanet.com/best-in-travel. It turns out that Szedeg is the third largest city in Hungary and that Lonely Planet recommends it as a “best place to visit.” I’m game! Lonely Planet publishes excellent travel guides covering the world. Their website is deep and deeply helpful. The British version of Lonely Planet Magazine is my favorite travel mag. Recently LP began a new American version of that magazine that costs less in North America than the British version. It may be more focused on places of interest to us. You can find both of these at Books-a-Million and at many other bookstores. Or just read about these lovely places online and dream! The photo at the top of this post is of the harbor at Hvar, Croatia, a place listed in the list of Best in Travel for 2017. 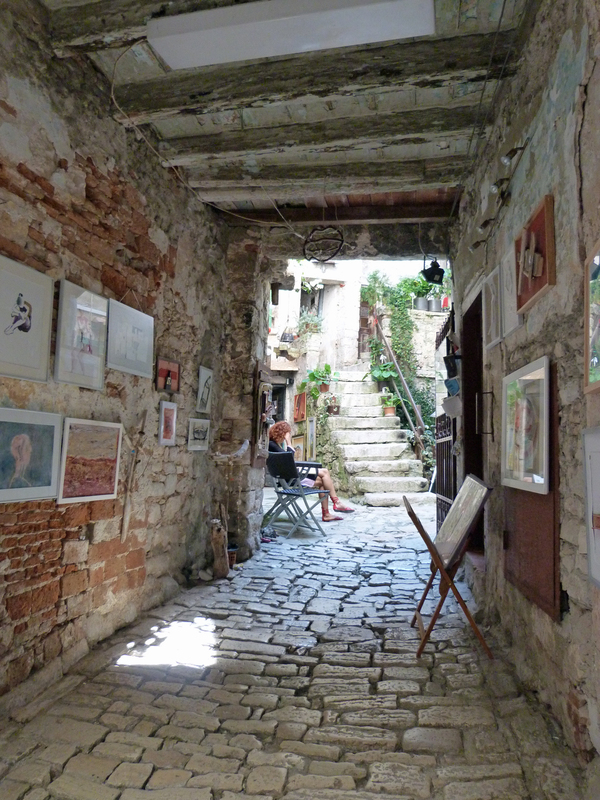 Nothing much has changed recently in the old town section of Rovinj. The latest buildings appear to date from the 1600s. One time I arrived on the magnificent Royal Clipper, approaching the city from the northern Adriatic in the early morning light. The tall tower of Saint Euphemia’s church stands in the center of the village, where it’s provided guidance to sailors for centuries. There’s no automobile traffic in the old town, where streets are paved with cobbles and are frequently too narrow to allow for anything wider than motor scooters and pedestrians. Pleasant cafés and small shops depend on tourists. 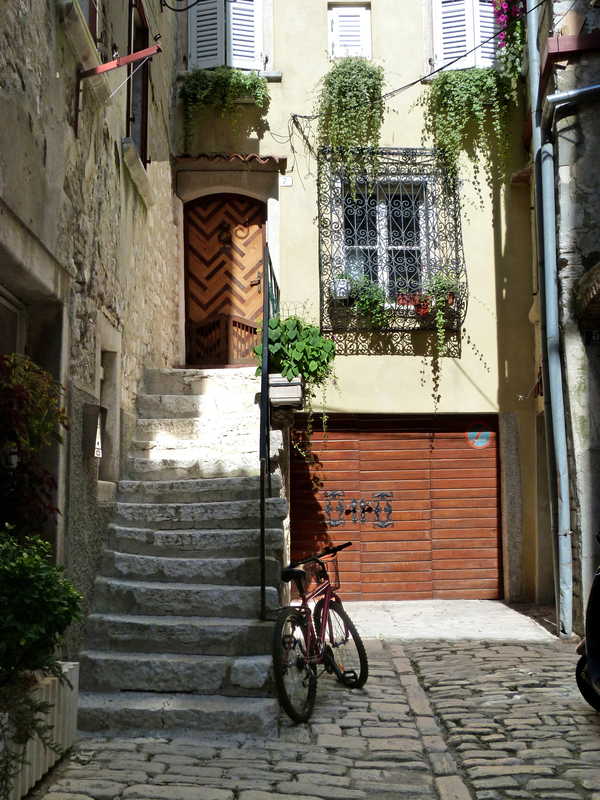 It’s possible to rent an apartment in this section of Rovinj and I’ve recently done that. I look forward to returning for a longer stay in 2016. 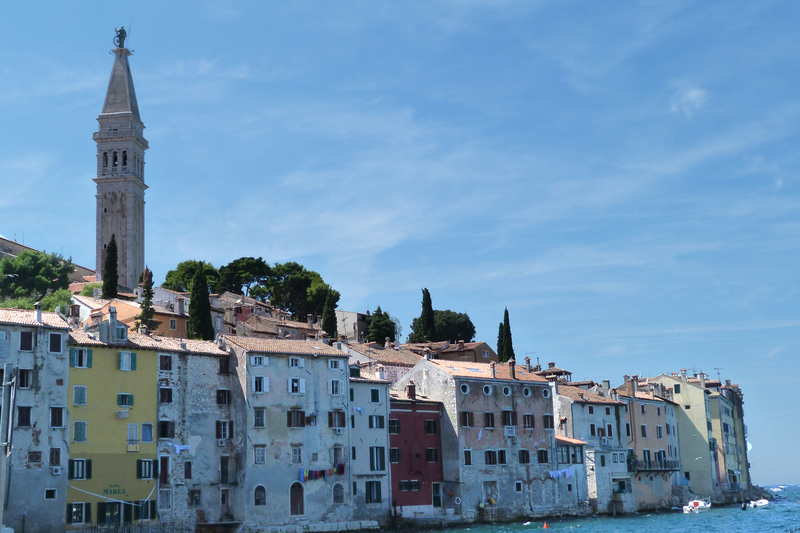 Pictures are definitely better than my words for giving you a taste of Rovinj. I hope you’ll enjoy these. 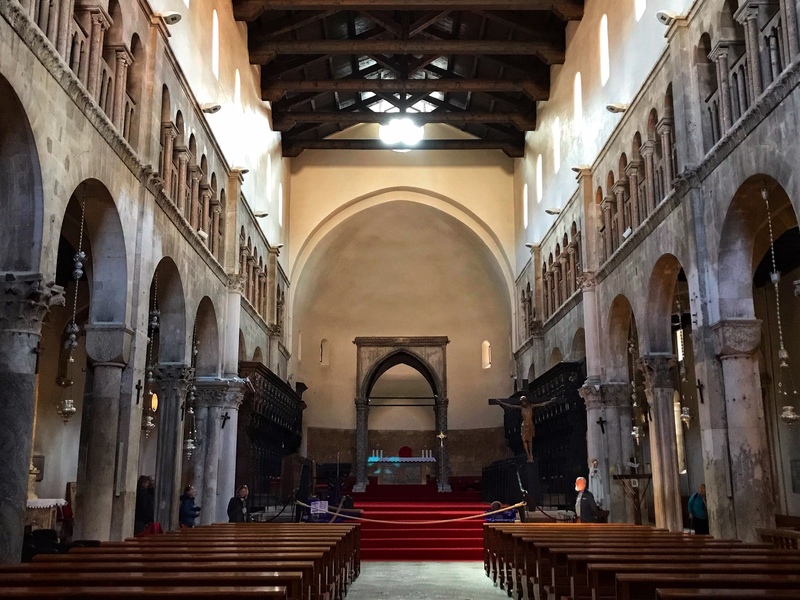 Upon entering Rovinj we were drawn, as if by a magnet, to the proud old St. Euphemia’s church. From the church we wandered through the old streets toward the center of the village. I was drawn to the morning market, as I am in any village, town or city I visit. A typical narrow street with laundry flying overhead. The entrance to some proud homeowner’s well-loved home. An art gallery in a passageway between ancient buildings. Too soon it was time to reboard the Royal Clipper to continue our cruise on the world’s largest clipper ship. 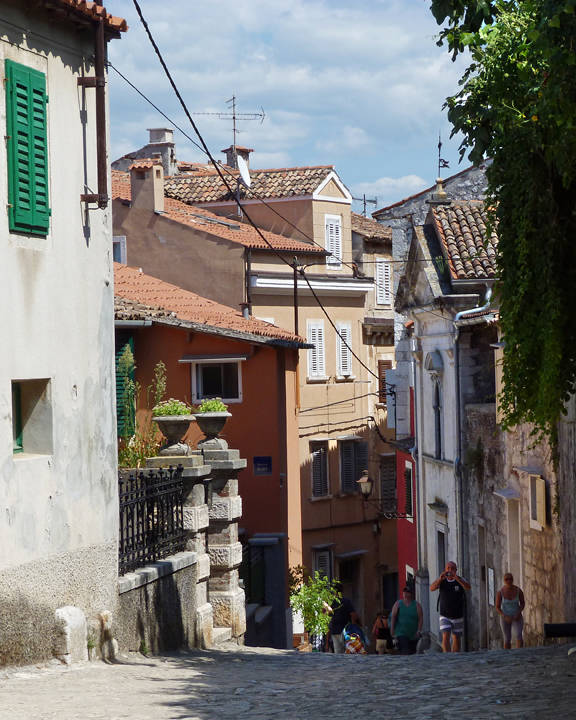 Have you been to Rovinj? To Croatia? Or do you have questions about going there? If so, I hope you’ll use the Comments section here to share your experience or to inquire. My plans for my upcoming long journey around Europe include a tour of Croatia’s coastal villages and islands using ferries and buses. This will be my fourth trip there so I’m aware of how charming and historic these islands are. Some of them were settled by Greeks as early as 500 BC. Croatia was controlled by the Venetians for hundreds of years and their imprint can be seen in the architecture of even the smallest village. Here’s a map of Croatia which shows its peculiar shape and its long northern Adriatic coastline. It’s been my dream for several years to spend weeks traveling from North to South along the coast of Croatia using the ferry system. Previously, when I tried to plan such a trip using the popular online ferry booking sites I couldn’t seem to find the connections I needed in the northern part of the country. Then I read this blog entry and discovered just how easily and inexpensively this could be done. The ferry system linking the islands to one another and to the mainland is much more extensive than my earlier web search revealed and the cost is very low. In addition I’ve discovered that buses are a readily-available source of transportation which is helpful because railroads rare on the Croatian coast. I’m using AirBnB and other apartment booking sites to arrange my stays. I’ll be there in June so I’m not getting the lowest rates but I’m also not paying peak season July and August prices. 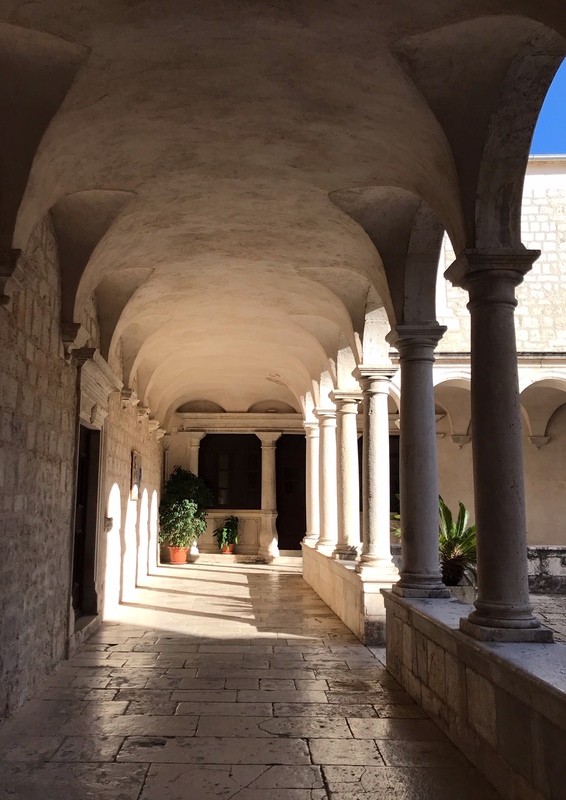 I’m not going to Split or Dubrovnik because my previous visits there were disappointing: too many tourists and recently prices have become astronomical. 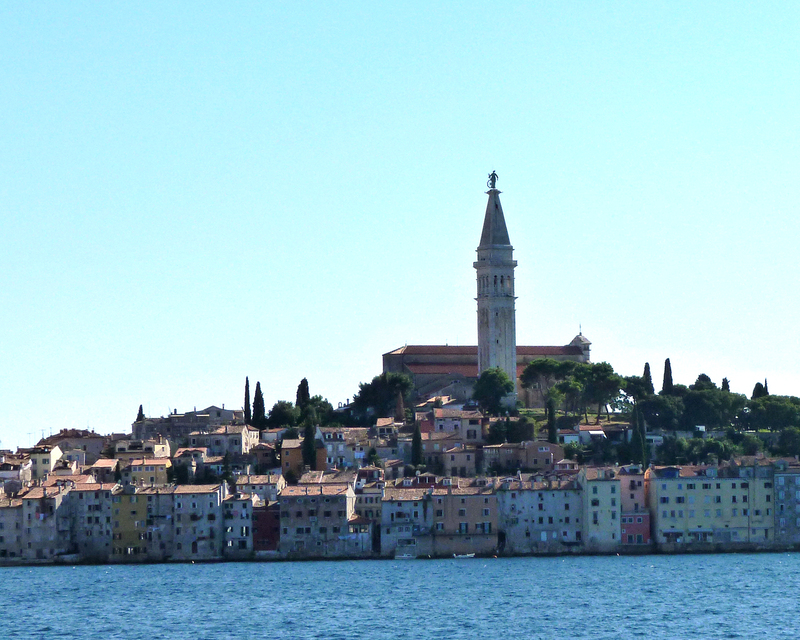 Instead I’ll visit Istria, a triangular peninsula in the north of the country and several islands in the Adriatic. I’m really excited about these plans. Stick with me and my blog until June for frequent reports! 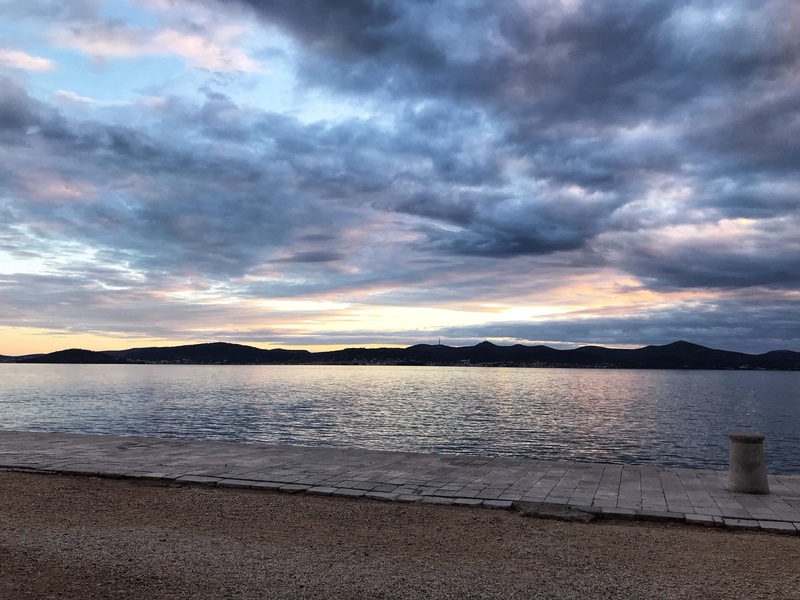 “Croatia’s best-kept secret: The tiny island of Losinj is big on wellness, secluded beaches and tranquil fishing villages.” This headline from the British online newspaper, The Mail, describes one of the islands I’ll be visiting while on my upcoming Star Clipper cruise. 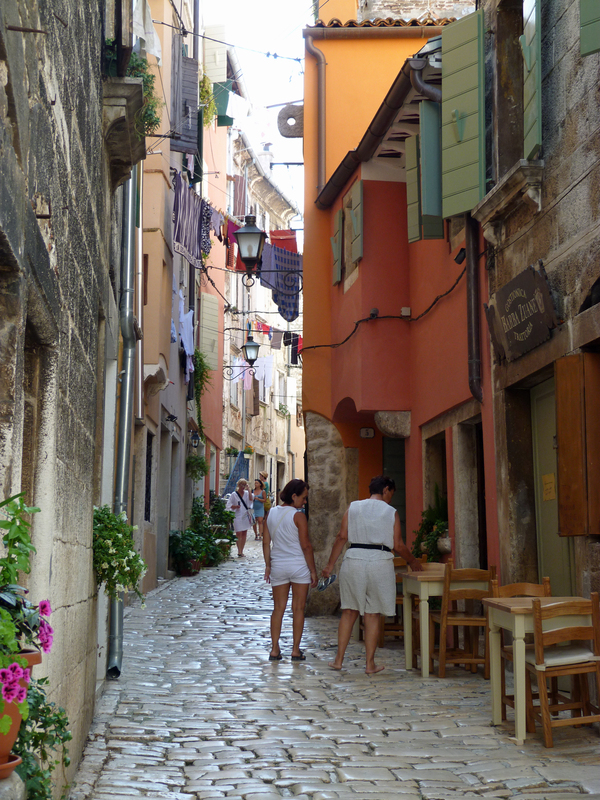 I’m excited about exploring Losinj! Later this month I’ll be sailing into Losinj on a clipper ship and I’ll enjoy a day of exploring several of the small villages on the island. Venetian in character (in keeping with the history of Croatia) these little known places draw more vacationers each year. 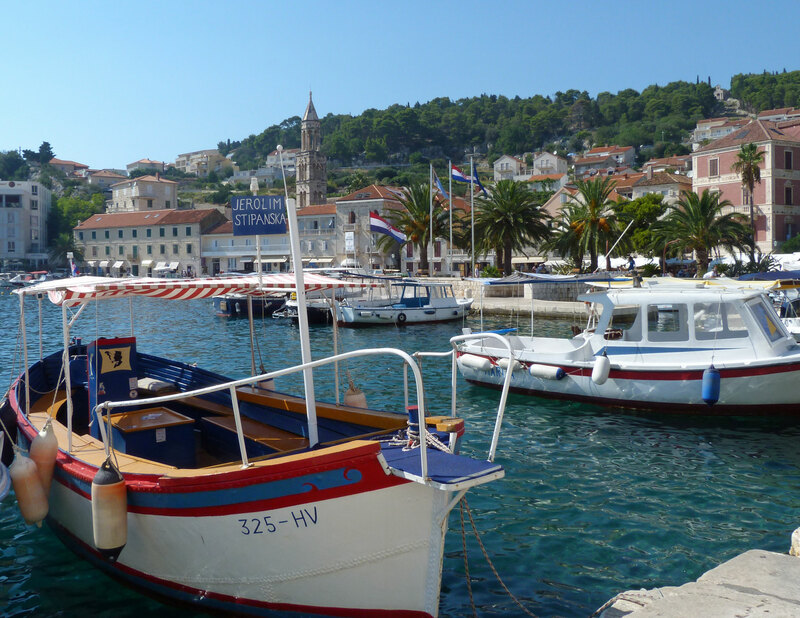 Fishing villages for centuries (and today), the principle towns called Mali Losinj and Veli Losinj also showcase the homes of wealthy 19th century ship captains and the villas of Austrian aristocrats who discovered the charms of these islands long ago. Some of today’s visitors arrive in their yachts. Others rent apartments and villas for their summer vacations and enjoy the long white sand and pebble beaches that outline the island. Veli Zal is a blue flag beach near Mail Losinj that may be the site of the last beach day of summer 2014 for some in our group. As the Mail article states, the island is “littered” with spas. 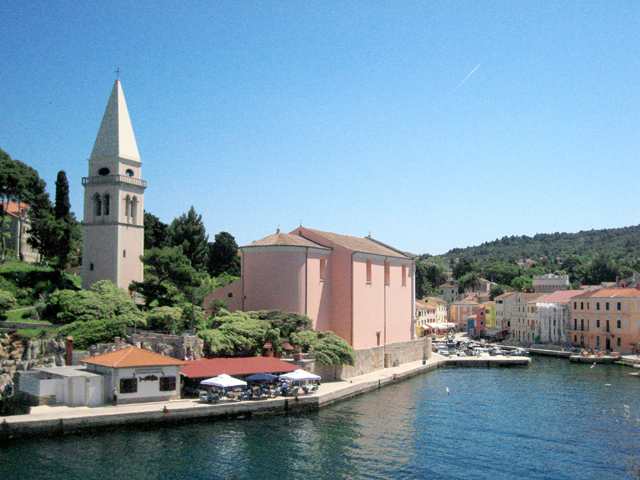 In Veli Losinj the old church tower dating from 1445 now houses a museum and art gallery. Another gallery can be found in the former church of Our Lady of the Angels which was built in 1510. I’ve learned about one or two restaurants worth searching out. Discovering these small communities is indeed something I look forward to. The article quoted above in the Mail Online provides interesting information about Losinj. The website of the official tourist office for Losinj is helpful. There are several online agencies on the island managing vacation rental cottages and apartments and offering other services to visitor. These include Puntarka Travel Agency (this site contains much information about Losinj) and www.losinj-croatia.com/. 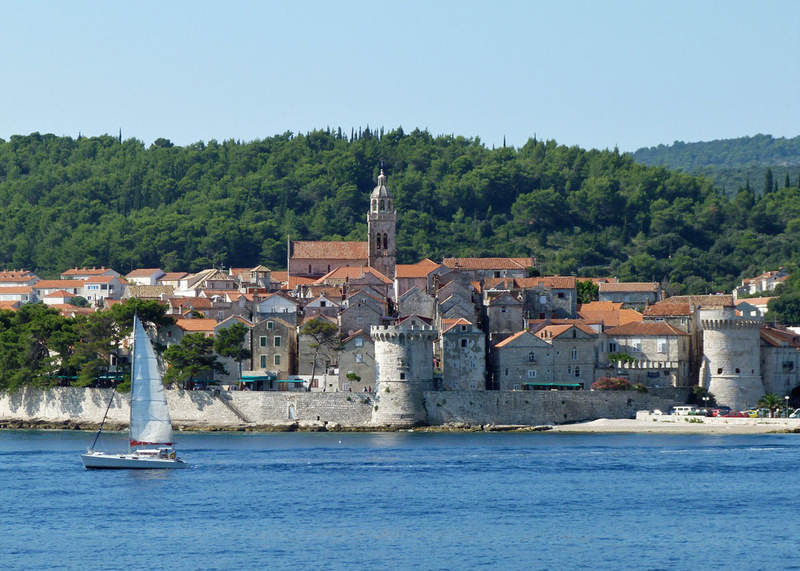 Sailing into the medieval town of Korcula on an island of the same name in the Adriatic, it’s easy to believe that we’re sailing back in time. The island appears to be little changed from the time of Marco Polo, said to have been born here in the year 1254. Still guarded by its walls and turrets, the small village (population under 3,000) is built entirely of stone, laced by narrow passageways where laundry flies like flags overhead. When I was there I was particularly fascinated by the carved edifice of the small cathedral. Built around 1300 AD, there are almost-obscene sculptures of Adam and Eve along with a very fanciful carved elephant, a crocodile, a winged dragon, gargoyles and monsters. I’m returning to Korcula soon. Perhaps this time I’ll wander outside the village, exploring the island during our long port call. Or I may just spend the day wandering through the passages with camera in hand. There will be time to return for lunch at a small restaurant on the edge of the island called Jelovnik for the freshest fish, Croatian potato salad, delightful local wine. Again I’ll dine outdoors, over looking the blue Adriatic. 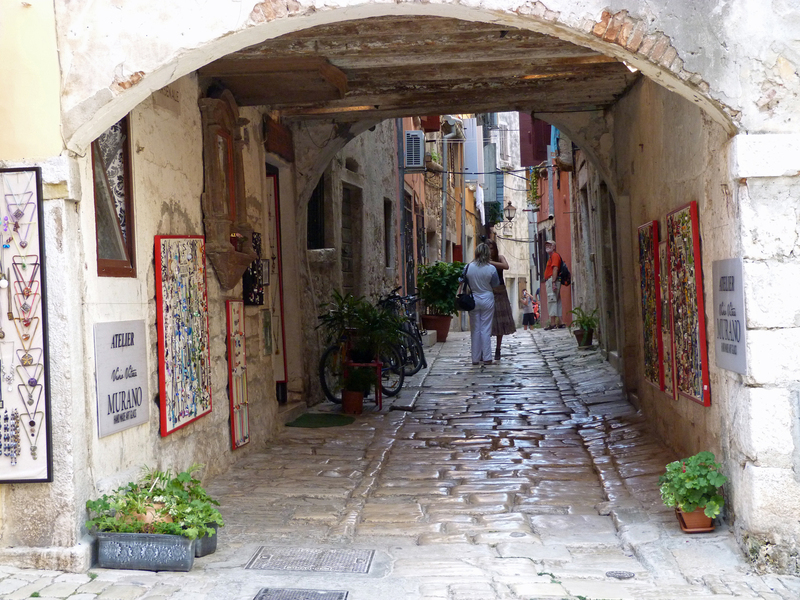 One of my favorite blogs is written by an Australian ex-pat who now lives in Croatia. She calls her blog Chasing the Donkey and calls herself “Mrs. Donkey.” Find her most interesting blog by clicking here. The link will take you directly to her page of Croatian language help.